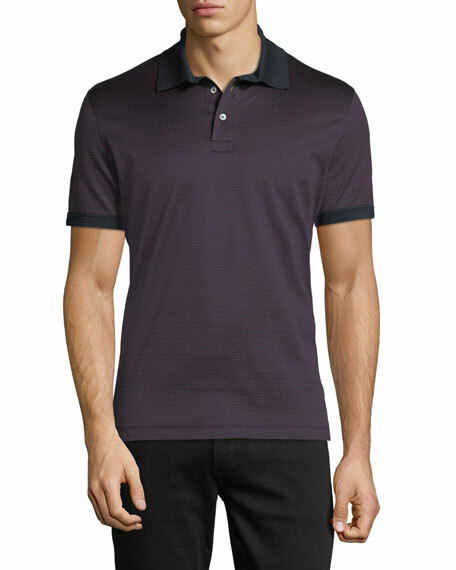 Salvatore Ferragamo knit polo shirt in allover Gancio jacquard. 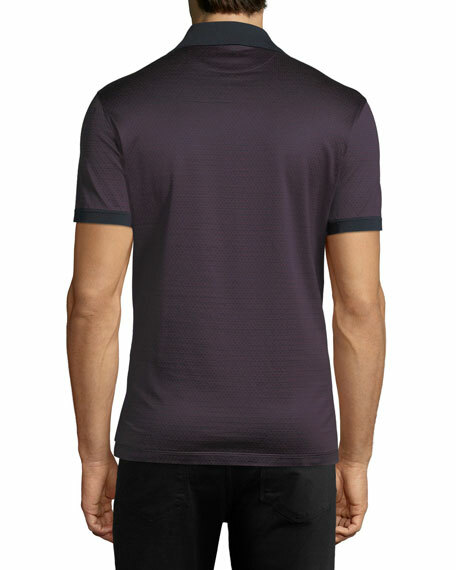 EXCLUSIVELY AT NEIMAN MARCUS Salvatore Ferragamo short sleeve sport shirt in Gancini-jacquard. Spread collar; French-placket button front. Short sleeves. Shirttail hem. Cotton. Made in Italy. Model's measurements: Height 6'1"/185cm, waist 32"/81cm, typically wears size M.
Salvatore Ferragamo piqué polo shirt. Embroidered tonal double-Gancio logo at chest. Spread collar; three-button placket. Long sleeves; barrel cuffs. Vented, uneven hem. Pullover style. Cotton. Made in Italy. Model's measurements: Height 6'1"/185cm, waist 32"/81cm, typically wears size M.